Rubenerd: Rubenerd Fugly Car Awards! 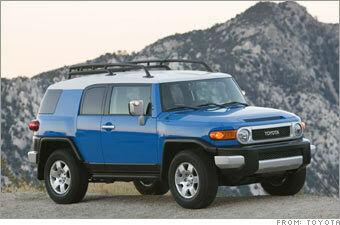 And the Rubenerd award for the fugliest car of the year goes to: the Toyota FJ Cruiser mini SUV! If you love SUV's but hate their thirst for oceans of expensive premium petrol and the dents they leave in your driveway when they're parked there for more than 5 minutes at a time, you'll love the FJ Cruiser! Comes with two doors that look out of place, rear windows that end in an awquard place, and bodywork lines that don't have a place! You won't want to be seen in any place or place this car in any place when you have the FJ Cruiser! Seriously though, who designed this car? Surely you couldn't get this Toyota in Asia… could you? Newer post ← The Desk: 25 Years!